My Place In The World: You Want Lights With That? You Want Lights With That? It's that time of year again. Time to get festive! I love putting my Christmas tree up and all the sparkle it adds to my living room. I was prepared when Devin arrived on Friday night. After (an awesome salmon) dinner, we started assembling the tree - fluffing out the fake branches and arranging the lights. Well, who am I kidding? I designated lights to him. It is a task I hate each year and now I have someone willing to take over? Yes! Once the tree was up and the lights were on, we decided to hit up Starbucks for a holiday drink. It was just the right thing to do. We eventually did get back to the tree and it was fun to explain all of my special ornaments to him - where I got them and the meaning behind them. When I was later admiring the tree in all of its twinkly goodness, I remarked that it's a shame there are no lights on the tree topper. Quite honestly, it looked a little goofy to have a star on the top of the tree without lights. When the room is dark, you can't even see the star! Devin reacted to this comment in the best possible way. "You want lights on your tree topper? I can put lights on your tree topper." And with that, he was outside at his truck, getting the tools he needed. 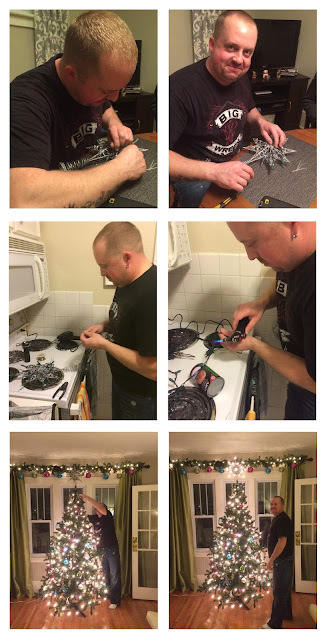 I was amazed as I watched him snipping, clipping, soldering etc. Even using a little micro torch. Wow! This was pretty freaking cool. My heart swelled when he put it on the top of the tree and plugged it in. Oh, honey. I love you! I think the most impressive part of this post is that he happened to have all of the appropriate tools on standby! ...and I agree, the lights are the worst part! Handsome and handy?? ding ding ding! You have hit the jackpot! Love you! Miss you!